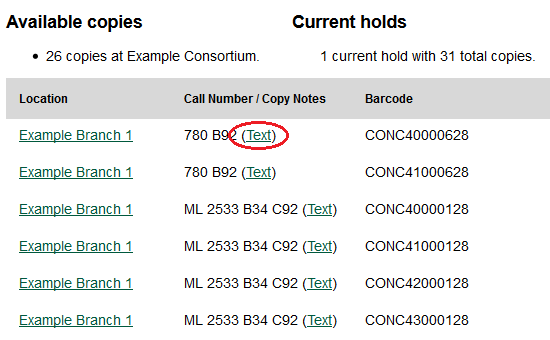 You can search the catalog for an item, and, after retrieving results for the item, click a hyperlink to send the copy information in a text message. Login to your account in the OPAC. NOTE: If you have disabled the setting that requires patron login, then you do not have to login to their accounts to send text messages. See Administrative Setup for more information. Search the catalog, and retrieve a title with copies. 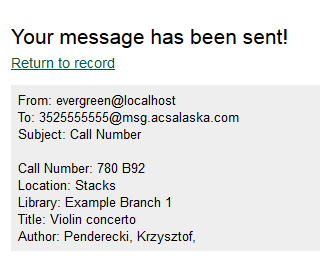 Click the Text link next to the call number. The text of the SMS Text Message appears. Choose an SMS Carrier from the drop down menu. 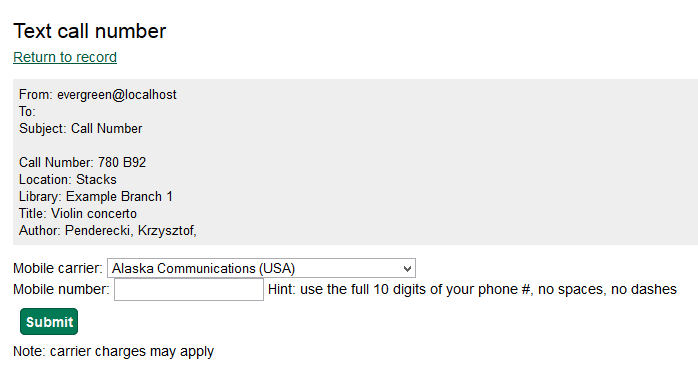 NOTE: You can enter your SMS carrier and phone number into your Account Preferences to skip steps five and six. Click Submit. NOTE: Message and data rates may apply. The number and carrier are converted to an email address, and the text message is sent to your mobile phone. The following confirmation message will appear. ADMIN_SMS_CARRIER - Enables users to add/create/delete SMS Carrier entries.